Electronic Bliss at Mountain Oasis Electronic Music Summit. Three nights of electronic music blazed forth the weekend of October 25-27 at the Mountain Oasis Electronic Music Summit in Asheville, North Carolina. Scattered across Asheville’s compact downtown in five different venues ranging from a bar to an arena, musicians plugged in with a range of electronic dreams. One musician was 77 years old with sounds that date back to 1968 while others dialed up computerized grooves from the future. And a few of them weren’t really electronic at all. 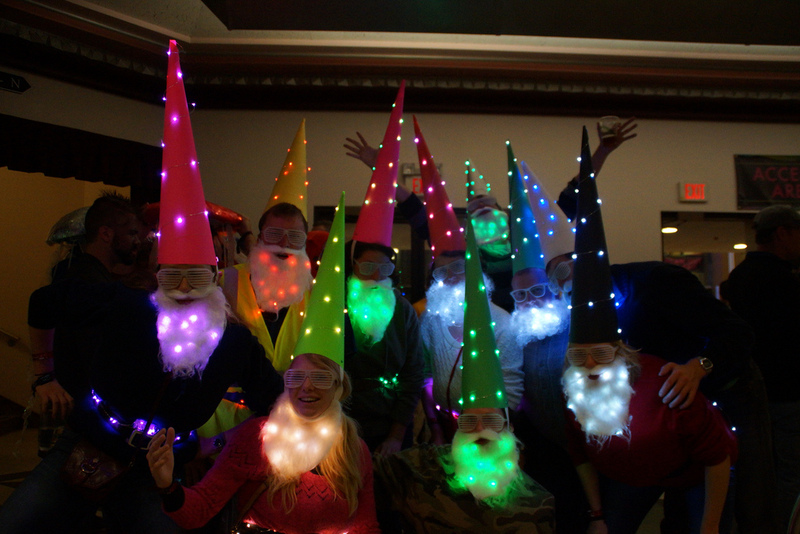 MOEMS Halloween revelers Photo: Criss Images. The Mountain Oasis Electronic Music Summit is the child of Moogfest who was kicked out of the house after three successful years. 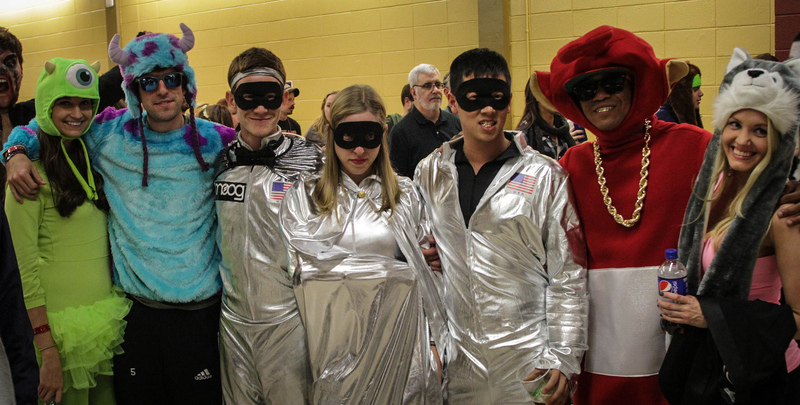 The Moog Corporation took back the licensing of their name for their own festival scheduled to be held in April. But original producers of Moogfest, picked up right where they left off in 2012 without missing a step and only making a name change. The festival was never a “Moog” festival to start with but with MOEMS the range expanded considerable to embrace music from across music frontiers. The range of the music could be triangulated in three acts, Jherek Bischoff, Silver Apples and Bassnectar. Bassnectar was the revelation of the festival for me. It’s one guy, Lorin Ashton, who stood on stage flanked by two laptops with a mélange of electronics in the middle. I got there a few moments late and as I approached the Exploreasheville.com Arena (one of the silliest venue names ever), you could hear the building shuddering from the bass inside. Entering from the back of the hall to a throng of bobbing people in full Halloween regalia on the floor, I felt like I was literally sucked into the crowd by Bassnectar’s hypnotic, throbbing beat. As I threaded my way to the middle of the arena, Ashton bounced around onstage, long hair flailing as he moved from computer to computer, stopping in the middle to twist knobs, tap pads and swirl around on a Kaos Pad or two. In fact, he didn’t seem to be on stage at all, but dissolved into a three dimensional landscape of shifting images projected front, back and sides. Giant butterflies, rotating diagrams, digital noise and landscapes all moved in a constant flow. Electronic rhythms pounded out of the speakers, as Ashton created drama and movement not through conventional melody but a collection of sound effects, electronic glitches and crushing grooves that dissolved before the inevitable bass drop. He rebuilt tracks from his albums, including his remix of Nina Simone’s classic “Feeling Good.” I wondered if anyone in the audience recognized the jazz artists who were projected in distorted imagery during that track. It could be argued that Bird, Diz and Max were the rave artists of their day, although I doubt few there knew who they were, let alone realized that none of them were on that 1965 Simone cut. I’m still from the “If it’s too loud, you’re too old” school. But as ecstatic as Bassnectar’s performance was, by the end of his set, the deep bass and the volume, over 112 decibels, became physically nauseating. 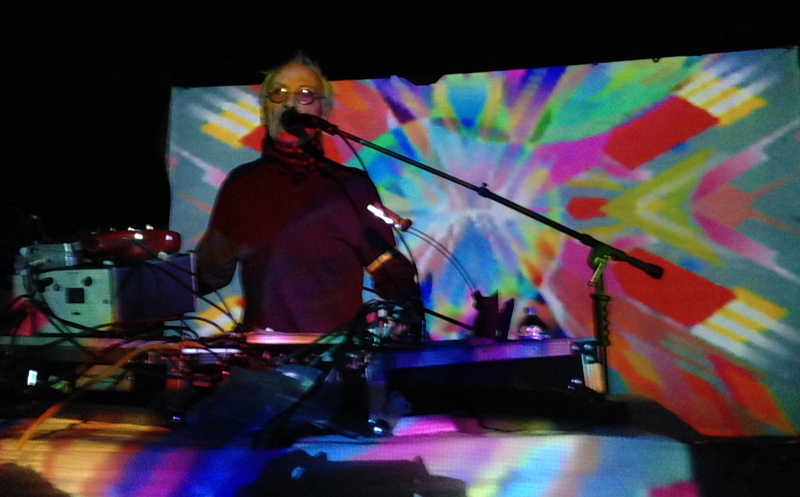 After Bassnectar’s arena filling audio-visual spectacle, Silver Apples seemed….. quaint. Silver Apples was a drum and electronics duo from 1968. Simeon Coxe made all his electronic sounds from an array of audio oscillators triggered with telegraph keys. They released two cult albums before breaking up, but they were unarguably the first electronic pop band. Now 77 years old, a little frail and bespectacled with short, thin white hair, Simeon is the only surviving member of the group. His technology has been updated, but the sound remains almost exactly the same. He even uses a trio of audio oscillators on which he plays his lead melodies and noises. He performed music from those first two albums spinning oscillator melodies with the ghost of Danny Taylor’s drums. Singing in a reedy voice against psychedelic projections, he intoned the largely trippy psychedelic lyrics of the band earnestly, but also with a bit of humor. It was a charming performance. And then there’s Jherek Bischoff. Ironically, he was the opening act of the festival, the irony being, he wasn’t electronic at all, launching this “Electronic” Music Summit with a ukelele. But then, there’s a lot of arch irony in this young musician. Standing at 6’3” he seemed even taller with a light brown pompadour and wearing a skinny tuxedo. He was like a cross between Buster Poindexter and Pee Wee Herman with the overbite of Kenneth from 30 Rock. You could find this contrast all over Mountain Oasis. Godspeed You! 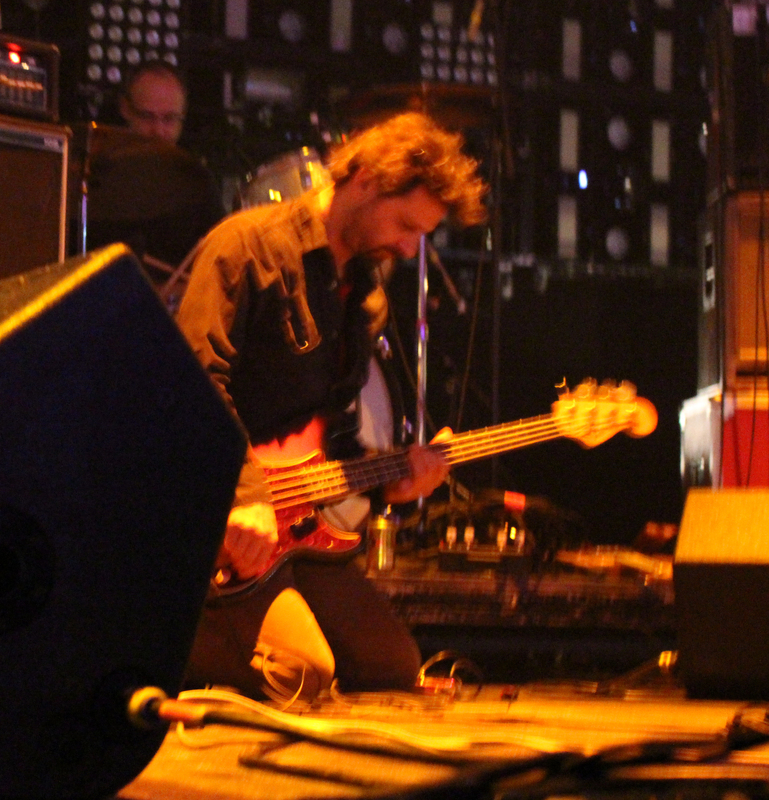 Black Emperor is a post-rock who were more guitar metal and noise than electronic although they certainly spent a lot of time adjusting their many signal processors. They played the big arena but shrunk their stage plot to a small semi-circle barricaded by guitar amps where all the guitarists sat down, staring at their foot pedals or kneeled down on the floor. Two percussionists were in shadows while the violinist and upright bassist stood impassively. In the dark, with only their black & white post-apocalypse urban landscapes and noise projections giving them any light, they unleashed a one hour assault of overdrive guitar glory, occasionally breaking the fog of distortion for some sweet violin melodies or glissando guitar and glockenspiel in the midst of the storm. In certain ways, Godspeed is the avant-garde edge of the full frontal assault brought by Nine Inch Nails. 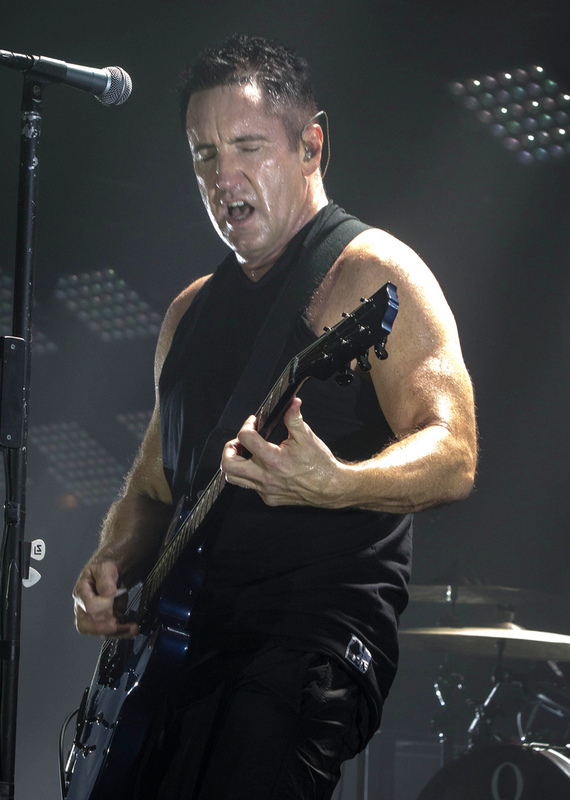 Founder Trent Reznor, in biceps baring muscle shirt, fronted his musically muscular band illuminated by an elaborate light array. They played a lot of music from their latest album, Hesitation Marks, grinding out unyielding grooves to back up Reznor’s songs of anguish and angst. There was little let-up in intensity except for a clunky Reznor keyboard solo and some inexplicable kamencheh, a middle eastern violin. Other than that it was all slabs of distorted guitar, relentless drumming and electronic screams. NIN can become plodding at times, but that wasn’t the case with a musician who influenced Trent Reznor: Gary Numan. This isn’t the robotic Numan of the “Cars” era. He hasn’t been that way for a while. With his jet black dyed hair, black t-shirt and black jeans, Numan was a Jesus of angst, flinging his arms out like Christ on the cross and jerking his body in tune to the music, often pouring water on his head and shaking it out like he’s just emerged from a baptismal bath. Numan’s voice is better than it has ever been. He’s lost that nasally whine and replaced it with an aggressive snarl. He played several tracks from his latest album, Splinter (Songs of a Broken Mind) and several songs from his later period which mixes electronics and metal. During a public interview session with journalist Geary Yelton earlier in the day, Numan lamented that people still only remember him for “Cars” (and in England “Are Friends Electric?”), but he pulled it out during his concert and played it with passion, albeit with a bit of a heavier edge. But he didn’t have to. This wasn’t a nostalgia audience. They were as ready for Splinter’s “I Am Dust” as they were for “Down in the Park” from Replicas. 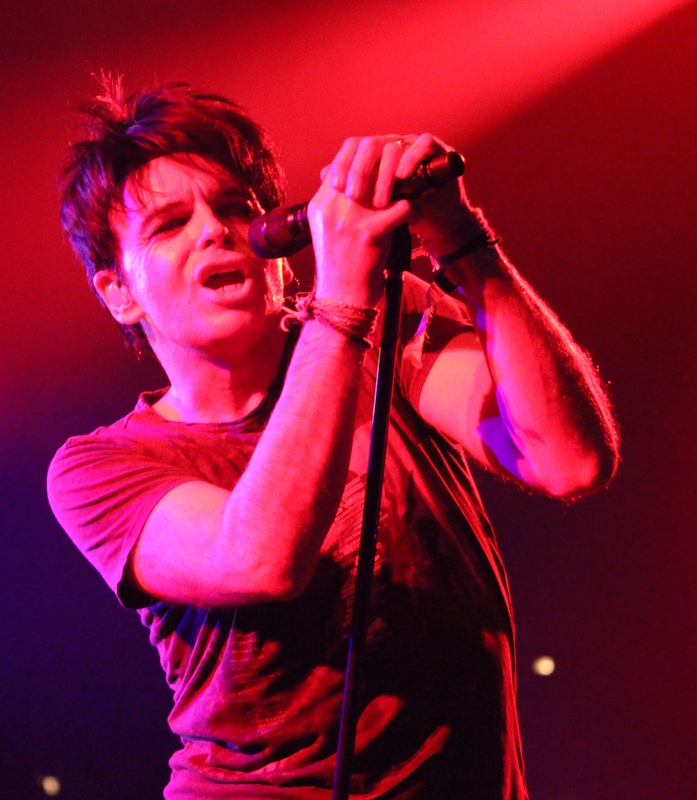 Gary Numan has been back for a while. It’s time people caught up with him. It was impossible to catch every act at the festival which featured five venues spread across 15 minutes walking distance with overlapping shows. But except for two regrettable instances, I went nonstop music sets from 7 until 2 AM 3 nights in a row. They were all highlights. The duo called Darkside played before an impressively large audience in the Thomas Wolfe Auditorium, considering they only have one album out, Psychic. Like Godspeed, they favored shadows, standing in twin cones of low, smoke filled light, delivering snarling guitar leads over throbbing electronic drums and sequences like a pong game on acid. They recalled the little known French band Heldon circa 1978 and shared their dystopian vision. It was like we were all in a bunker with bombs going off outside. The long-lived band, Sparks, was more in line with Bischoff than anything else at the festival. The brothers Ron & Russel Mael took the large Diana Wortham stage and planted Ron far left at a single Roland keyboard (which he had renamed Ronald) while Russell roamed around the otherwise empty stage. They call it their “Two Hands, One Mouth” tour. Apply sexual innuendo here. Ron has traded in his Hitler mustache for a pencil look. With his trousers hiked up above his waist, short hair slicked back and scowling eyes behind round hornrimmed glasses, he was like the cranky old geezer down the street. Russell looked discomfortingly like a Hitler youth which is a good trick since he’s 65. He had his black hair swept across his forehead Adolf-style, wearing black shirt, black tie and black shorts. That image was intentionally undermined, however, by his black tights and black and white patent leather saddle shoes with the toes curved up in elfin fashion. Their show was a cross between Joel Grey’s Cabaret and a Broadway tryout as they romped through their catalog with no accompaniment or backing tracks. 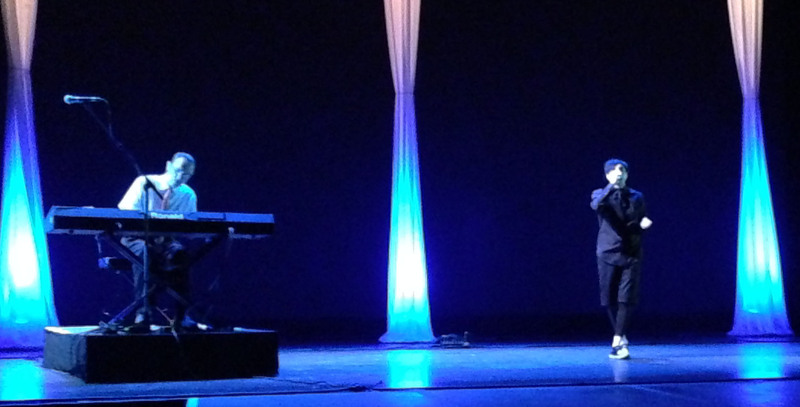 It was an arch performance to say the least with Russell Mael still able to summon that calliope voice. It highlighted the fact that Sparks aren’t really rock musicians, but performance artists closer to Laurie Anderson than Mick Jagger. You could easily imagine Anderson singing “Your Call’s Very Important To Us, Please Hold.” They seemed thrown off early on by monitor sound issues. At one point both musicians heatedly stormed the offstage mixing board. But they settled in for an entertaining, if austere set. 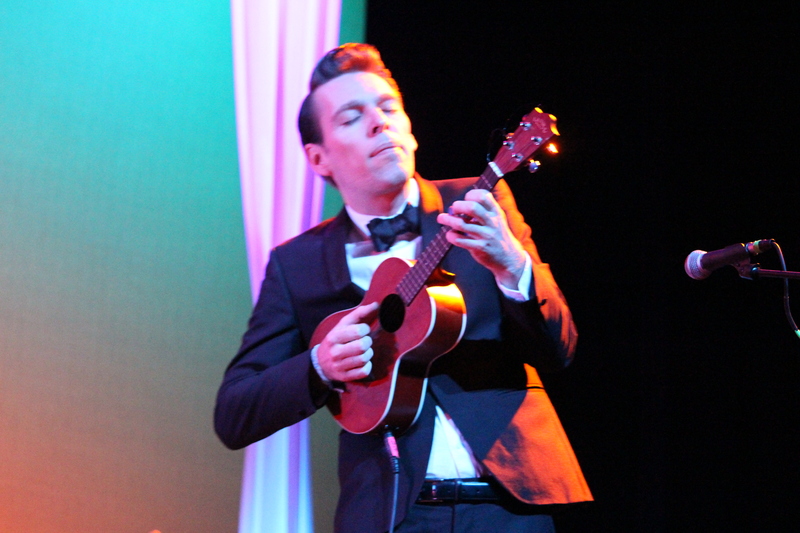 And no one loved it more than Jherek Bishoff who sported a happy lunatic grin throughout the show. 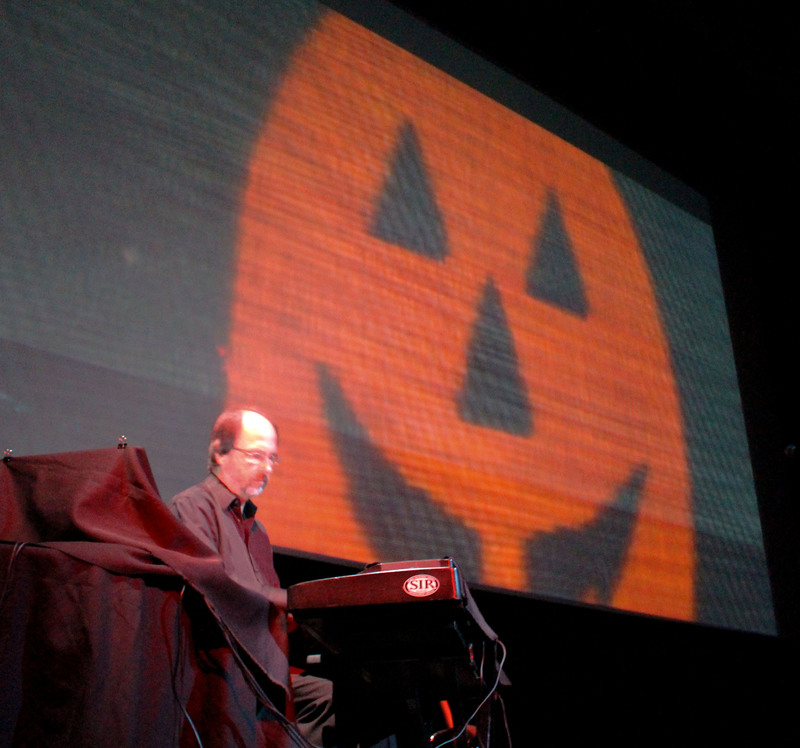 On the same stage, Alan Howarth played his film music. Best known for his work scoring John Carpenter films, he was accompanied by a manipulated video collage of movie clips including Escape from New York, Halloween II-infinity and They Live. He assayed his scores with backing tracks while he played electric keyboard and synth-guitar. 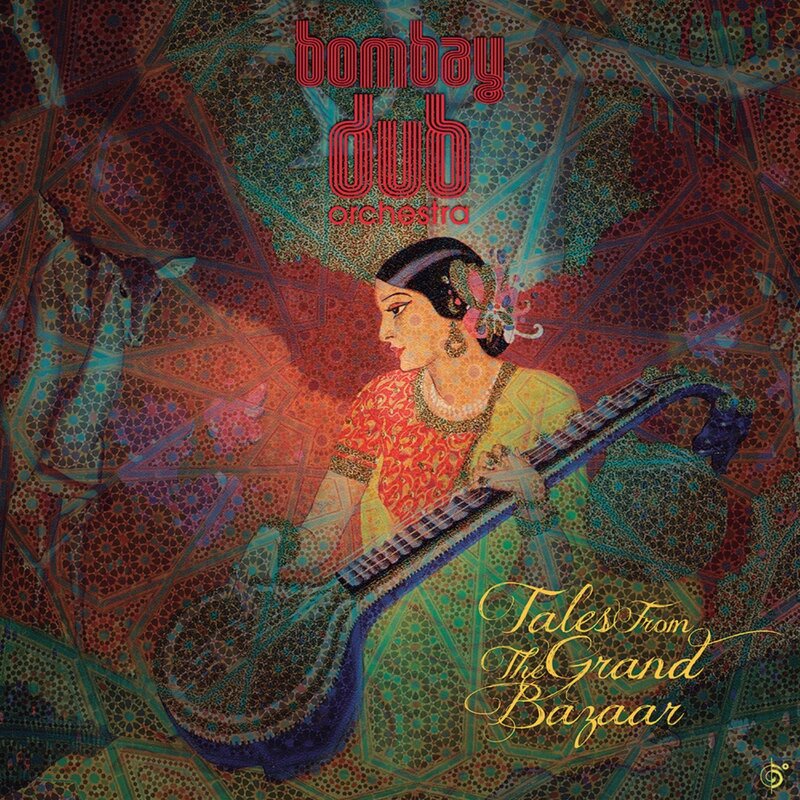 It was an engaging medley that harkened back to an older electronic sound. 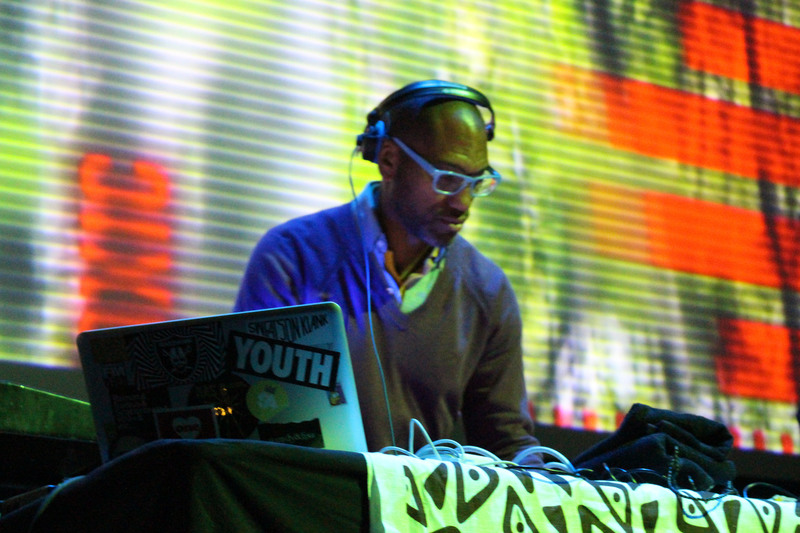 Philadelphia’s King Britt made his second festival appearance with his latest project, Fhloston Paradigm, named for Fhloston Paradise, the resort spaceship in The Fifth Element. Joined on stage by singer Pia Ercole and live visuals from Mike Todd, they created some deep space music that had EDM edges but was more redolent of 70s German space music. Ercole sang wordless vocals that were looped, relying a bit too much on long oohs and aahs, while Britt played keyboards and computer creating deep throb ostinato rhythms and swirling textures. 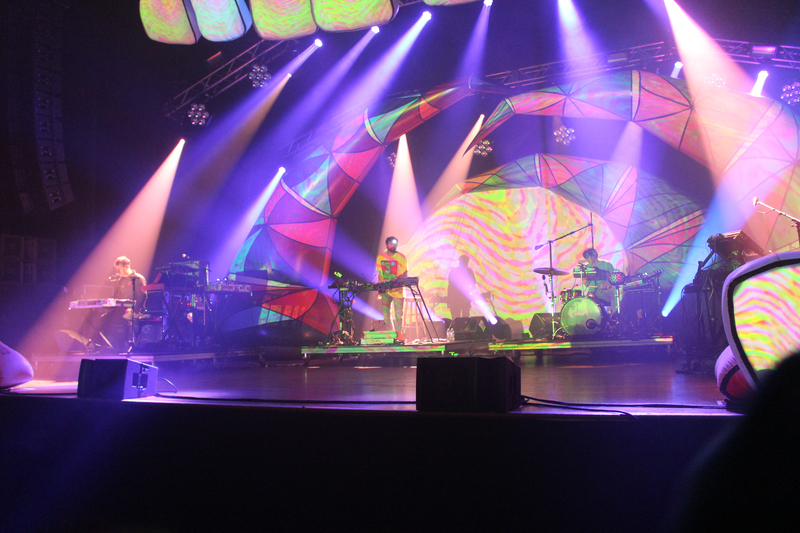 I only caught a few songs from Animal Collective and Purity Ring, both of which seemed to have lively sets going. AC sat inside what looked like a abstract cartoon gap toothed mouth with projections on the teeth and roof of the mouth. 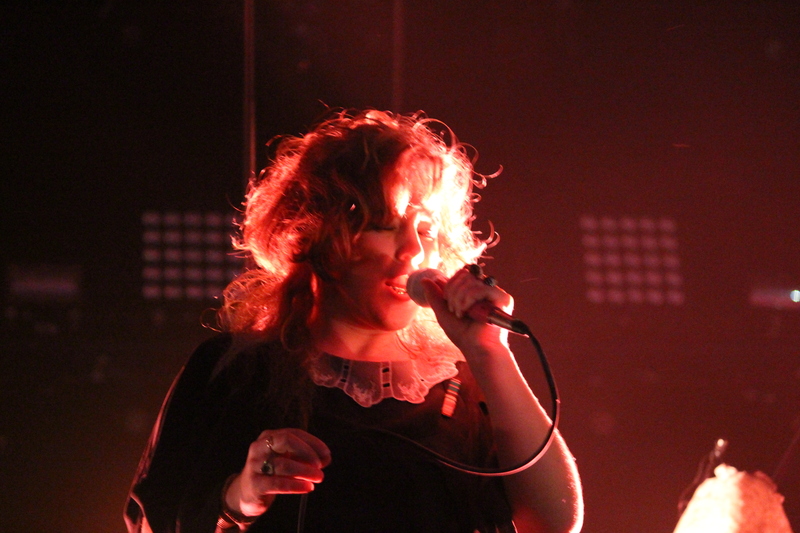 Purity Ring, a duo called in at the last minute to sub for Tricky, had no staging but diminutive vocalist Megan James held the audience, confidently singing their bright synth-pop. Corin Roddick held down the electronic side, surrounded by what looked like small Chinese lanterns that the two would strike with drum sticks although their effect was somewhat ambiguous. I regretfully missed Ulrich Schnauss and William Basinski and I wanted to see them both. 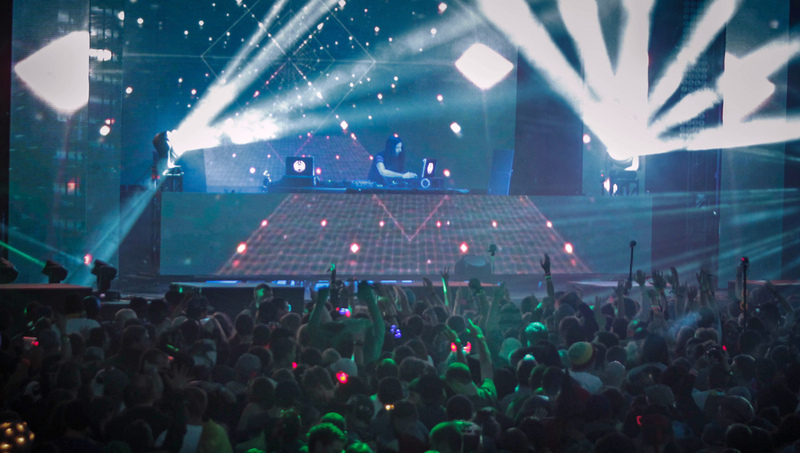 And after hearing Bassnectar, I would’ve liked to have seen Pretty Lights with a full band. Bands like Deltron 3030 gave massive shows to the rap side of the spectrum. 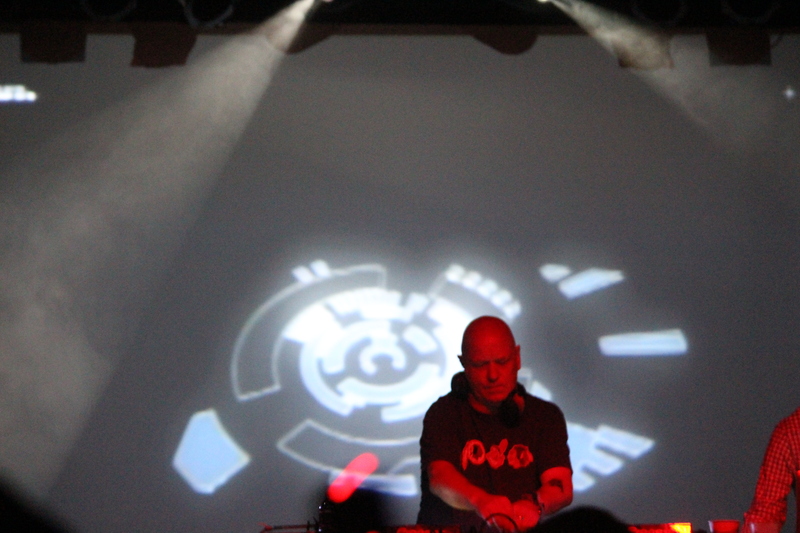 The festival ended with the now venerable ambient avatars, The Orb. Celebrating their 25th anniversary this year, The Orb is essentially the bald-headed Alex Paterson and whoever he can rope in with him. 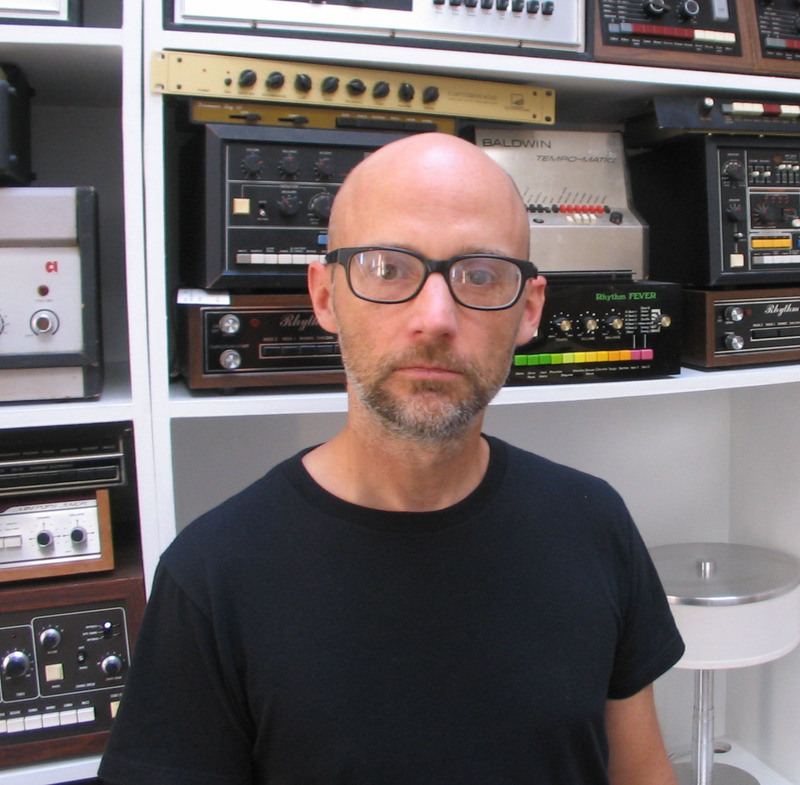 For MOEMS it was electronic artist Thomas Fehlmann. 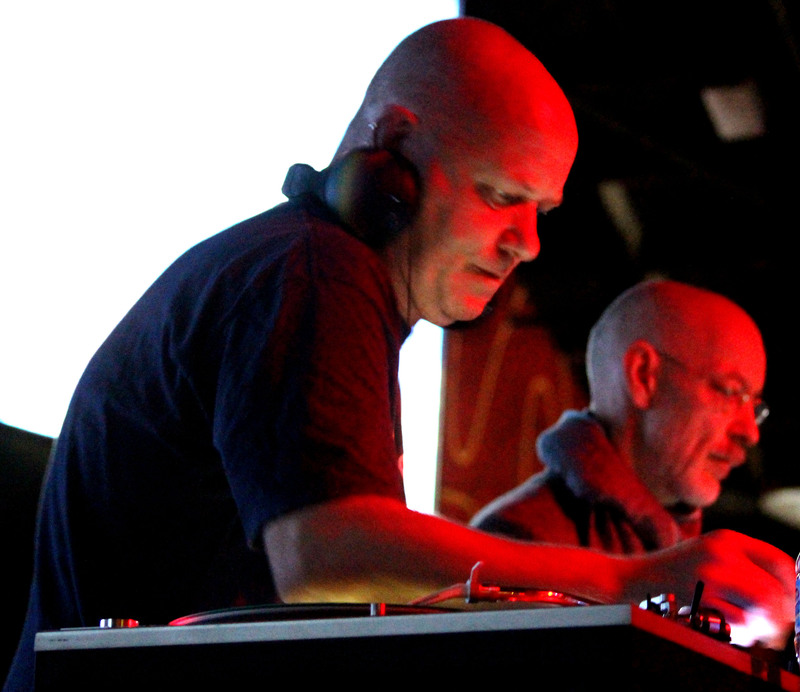 On the medium sized club stage of The Orange Peel, The Orb instantly set the mood with an abstract collage opening of found sounds, music snippets, disembodied spoken word, all swirling in a beat-free swirl. The full house stood patiently waiting, letting their minds rove free in Orb space. Then the rhythm kicked in and everyone went crazy. This was classic Orb as Patterson picked up vinyl LPs, slotted in CDs and mixed and matched his sounds against the beats of Fehlman and the live mixed video projections which were by turns abstract, surreal and deliriously funny. The Orb dropped in Miles Davis organ, Easy Listening strings, cartoon music, lots of dub, random announcements, old instruction records and a collage of noise. He didn’t play “Little Fluffy Clouds” but he did slip in the sequencer riff. Like Silver Apples, there was quaintness to The Orb. Their techniques harken back to early musique concrète of Pierre Henry and Pierre Schaeffer, only with a beat. And unlike acts such as Bassnectar, they are avant-gardists at heart. But they kept the room enthralled with the least amount of audience churn I experienced at the festival and proved a satisfying conclusion to a festival that looks backwards and forwards, sometimes simultaneously. Sign up for Echoes CD of the Month Club. This month, CD of the Month Club members will be getting Akara’s The World Beyond. Follow the link to the Echoes CD of the Month Club and hear what you’ve been missing. Ascend the Mountain Oasis Electronic Music Summit on Echoes. There are many electronic music festivals out there from the Detroit Music Festival to the Ultra Music Festival. But none have the breadth of acts you’ll find at the Mountain Oasis Electronic Music Summit, the successor to Moogfest in Asheville, North Carolina. (Moogfest is slated to relaunch the end of April, 2014) The music ranges from the ambient sounds of The Orb to the new wave electronics of Gary Numan to the dark obsessions of Nine Inch Nails. Tonight, I plug in with Ashley Capps, the festivals promoter and talk about ukeleles, Silver Apples and Halloween darkness. Ashley Capps of Mountain Oasis Electronic Music Summit. There’s a lot of great Echoes acts at MOEMS including Ulrich Schnauss, The Orb, Jherek Bischoff, Gary Numan, Darkside, and Bass Nectar and a lot of bands I expect to blow my mind like Nine Inch Nails, Godspeed you! Black Emperor and Animal Collective. I’ll be covering it all for Echoes, so check it out in the Echoes Blog, on Twitter @EchoesRadio, on Instagram @EchoesRadio and on Facebook @EchoesFans. Find out about Mountain Oasis tonight on Echoes. Sign up for Echoes CD of the Month Club. This month, CD of the Month Club members will be getting Akara’s The World Beyond. Follow the link to the Echoes CD of the Month Club and hear what you’ve been missing. Back in the early 1960s, Bell Laboratory’s inventor, Max Mathews created a lot of the early synthesizer and computer music technology. His program called Music was one of the first for making music on computers. He predicted that in the future, anyone, musicians and non-musicians alike, would be able to make music. 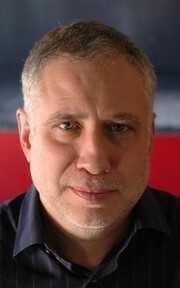 Alastair Brown is a musical grandchild of Max Mathews. He doesn’t play keyboards. He makes music on a computer in his home studio in England. Using the name Northcape, he’s received some acclaim for his post techno-electronic music. He recently released the album, Exploration and Ascent. Hear him talk about it tonight on Echoes. Find your local Echoes station or streaming options here. 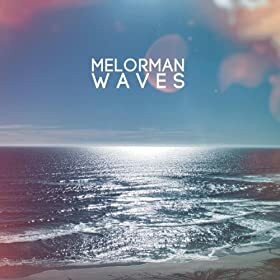 If you like Northcape, you’ll love his SunSeaSky label mate, Melorman and the album, Waves. It’s the Echoes August CD of the Month. Sign up for the Echoes CD of the Month Club you’ll get great CDs every month. Follow the link to the Echoes CD of the Month Club and see what you’ve been missing. Back in the early 1960s, Bell Laboratory’s inventor, Max Mathews created a lot of the early synthesizer and computer music technology. His program called Music was one of the first for making music on computers. He predicted that in the future, anyone, musicians and non-musicians alike, would be able to make music. Alastair Brown is a musical grandchild of Max Mathews. He makes music on a computer in his home studio in England. 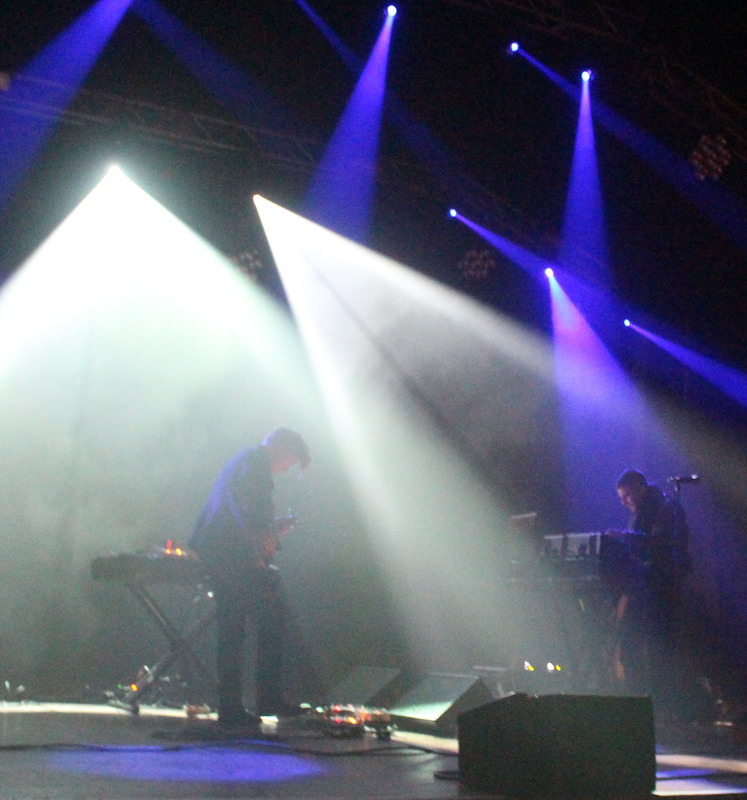 Using the name Northcape, he’s received some acclaim for his post techno-electronic music. He recently released the album, Exploration and Ascent. Hear him talk about it in the Echoes Podcast. Sign up for Echoes CD of the Month Club. 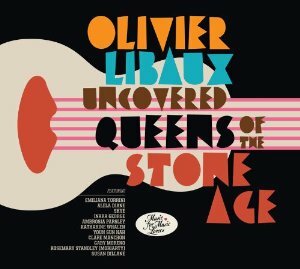 With the Echoes CD of the Month Club, you get great CDs like Olivier Libauxs Uncovered Queens of the Stone Age. Follow the link to the Echoes CD of the Month Club and see what you’ve been missing.